The Magazine of Fantasy and Science Fiction began its life as The Magazine of Fantasy. By the second issue the words "and Science Fiction" had been added. Why? Because no pure Fantasy magazine had ever made it past five issues. Weird Tales had been more Horror than Fantasy. Unknown published John W Campbell's version of Fantasy, but a brand for Science Fiction readers, almost an anti-Fantasy at times. Cele Goldsmith and the long-running Fantastic knew this too and the mix had always been heavier to the SF side. During the early 1960s Goldsmith cultivated Sword and Sorcery writers like Fritz Leiber, bringing him back to magazine publishing with new Fafhrd and Grey Mouser tales. 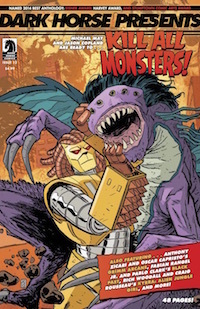 She also brought in new writers like John Jakes with Brak the Barbarian and Roger Zelazny with Dilvish the Damned. This continued until June 1965 when Goldsmith (now Lalli) left the publication when Fantastic was sold to Sol Cohen, with a change from monthly to a bi-monthly schedule. Laili was replaced by Joseph Ross (Joseph Wrzos) who inherited a huge stockpile of stories from the old days of the Pulps. 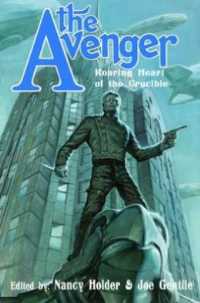 Fantastic became a reprint magazine, its first new issue containing only one original story, the Fafhrd and Gray Mouser tale "Stardock". Ross published the small reserve of Fantasy tales purchased before the switch that included Avram Davidson's classic novel The Phoenix and the Mirror and "The Bells of Shoredan" by Zelazny. Amongst the reprints was the Pusadian tale "The Eye of Tandyla" by L Sprague de Camp (from Fantastic Adventures, May 1951). But Ross wasn't long for the position, being replaced by Harry Harrison and later Barry N Malzberg. Both Harrison and Malzberg would leave over the reprints that plagued the magazine. They wanted to edit a magazine of new, modern Science Fiction and Fantasy. Fantastic needed a new editor. One who could present both quality Science Fiction and Fantasy. 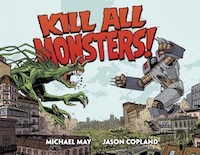 Cohen was willing to sell his reprints in other formats and leave the new editor to his work. A choice was found with Robert Silverberg's help: junior editor from FaSF, Ted White. For ten years White would create a magazine that featured intriguing works of Fantasy as well as decorate it with great artists including Jeff Jones, Mike Kaluta, Ken Kelly, Harry Roland, and Stephen Fabian (and occasionally Joe Staton's pieces that remind me of DoodleArt). And this with the major handicap of low pay, for Fantastic offered its writers only one-cent a word in a marketplace that usually paid three to five cents. 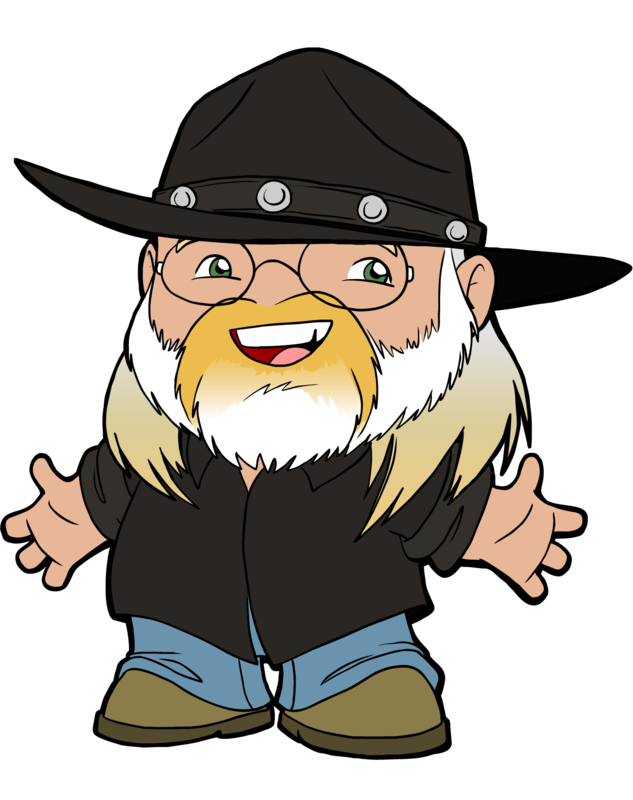 By cultivating new writers and snapping up gems where he could, White offered stories that often were chosen for the Year's Best Fantasy collections and even won the occasional award. White's debut was April 1969 and its contents were not spectacular, chosen by others. The only hint of what was to come was Fritz Leiber's review column on ER Eddison's The Worm Ouroboros. It would have to wait until December 1969 before a truly interesting Fantasy would appear. This was Piers Anthony's Arabian Nights inspired Hasan, which Anthony supported with an essay on Arabesque Fantasy. April 1970 saw another Fafhrd and Gray Mouser tale, a series dating back to Goldsmith but one that White was happy to continue. "The Snow Women" is a tale of Fafhrd's youth set in the cold north. Two more would follow in later years, "Trapped in the Shadowlands" (November 1973) and "Under the Thumbs of the Gods" (April 1975). At this time Leiber was collecting his tales into the first collections of Lankhmar and the new material would later be included. Also in the April 1970 issue was John Brunner's "The Wager Lost by Winning," part of his Traveller in Black series, of which he would continue with "Dread Empire" (April 1971). Brunner, a British author known for his Science Fiction, created something different in these tales of the odd little wizard who roams the world, and they would win him a place in the Thieves' World alumni eight years later. 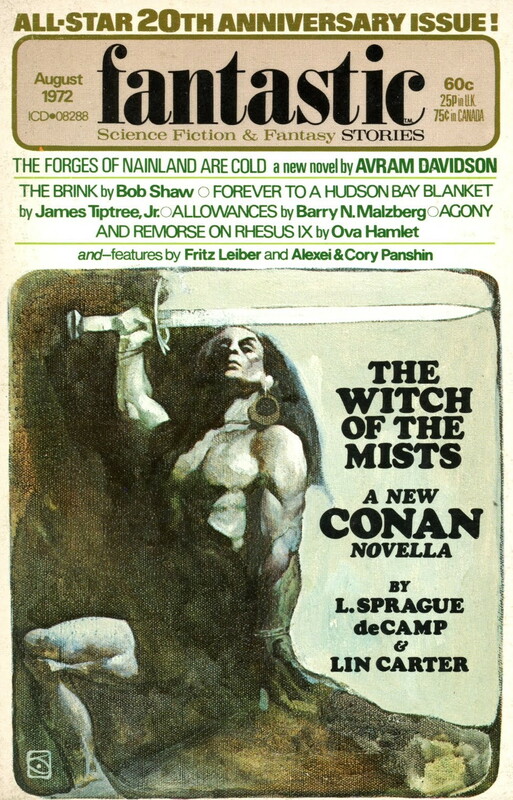 June 1971 featured a new non-fiction series, "Literary Swordsmen and Sorcerers" by L Sprague De Camp. This series of articles looked at classic Fantasy authors including Robert E Howard, HP Lovecraft, Fletcher Pratt, William Morris, L Ron Hubbard, TH White and JRR Tolkien, running off and on until 1976. These pieces offered intriguing insight into the lives and trials of Fantasy writers, leading de Camp to write the first major biographies of both Lovecraft (Lovecraft: A Biography), 1975) and Howard (Dark Valley Destiny, 1983). 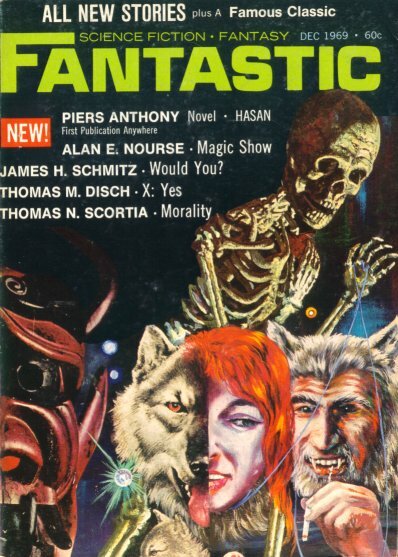 February 1972 saw the first of the Michael Moorcock stories to appear in Fantastic, with "The Sleeping Sorceress" starring the albino superstar, Elric of Melnibone. Later the same year, Count Brass featuring Dorian Hawkmoon would appear in August 1972. Both characters would become one as Moorcock melded his multiverse together to include everyone from Elric to Sojan to Jerry Cornelius. 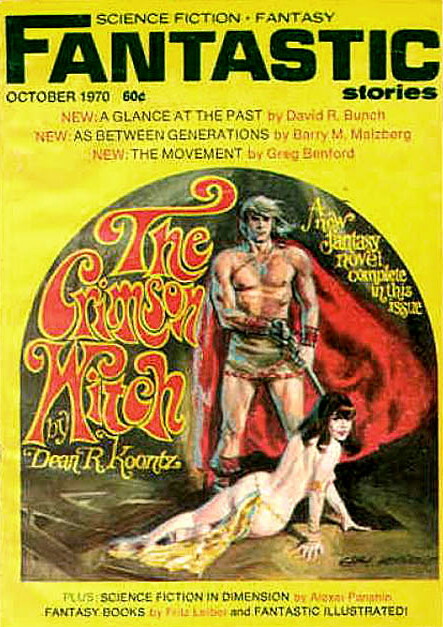 White published the magazine versions of several good heroic fantasy novels during his decade: The Crimson Witch (October 1970) by Dean R Koontz, which feels more like Sword and Planet, like Ted White's own "Wolf Quest" (April 1971), "The Forges of Nainland are Cold" by Avram Davidson (Ursus of Ultima Thule in book form) in August 1972, The Fallible Fiend by L Sprague de Camp (December 1972-February 1973), part of his Novaria series, "The Son of Black Morca" by Alexei and Cory Panshin (Earthmagic in paperback) in April-July 1973, The White Bull by Fred Saberhagen (November 1976) who was moving away from the robotic Berserkers to become a Fantasy bestseller, and The Last Rainbow by Parke Godwin (July 1978). All of which would populate the book racks of the 1980s. August 1972 saw the beginning of a series of new Conan pastiches by L Sprague de Camp and Lin Carter. "The Witches of the Mist" (August 1972), "The Black Sphinx of Nebthu" (July 1973), "Red Moon of Zembabwei" (July 1974), and "Shadows in the Skull" (February 1975), all of which form Conan of Aquilonia. Lin Carter groused in his intros to Year's Best Fantasy about this book, which had been stuck in legal limbo with the collapse of Lancer. 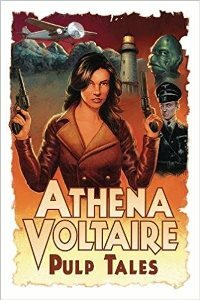 Finally free, it appeared serially in Fantastic then in paperback in 1977. Several other Sword and Sorcery series got a new start or a first start in Fantastic. Lin Carter wrote new tales of Thongor's youth with "Black Hawk of Valkarth" (September 1974), "The City in the Jewel" (December 1975) and "Black Moonlight" (November 1976). He also offered posthumous collaborations with masters Robert E Howard in "The Tower of Time" (June 1975) - a James Allison reincarnation story - and with Clark Ashton Smith in verbose Mythos-heavy pieces, "The Scroll of Morloc" (October 1975) and "The Stair in the Crypt" (August 1976). The February 1977 issue featured an interview with Lin Carter that was informative about his days on the Ballantine Fantasy series and other Fantasy goings-on in the 1960s and 1970s. Brian Lumley published some of his first Primal Lands tales, part Lovecraftian horror, part Sword and Sorcery in Fantastic. These included "Tharquest and the Lamia Orbiquita" (November 1976) and "How Kank Thad Returned to Bhur-esh" (June 1977) . Lumley's Fantasy harkens back to Weird Tales and the works of HP Lovecraft's Dreamlands and Clark Ashton Smith's sardonic fantasies. Another good start was made by Australian writer Keith Taylor, who wrote about wandering singer and swordsman Felimid mac Fel. These stories were the embryonic form of the book Bard, which Taylor began under the pseudonym Denis More. "Fugitives in Winter" (October 1975), "The Forest of Andred" (November 1976), and "Buried Silver" (February 1977) form the first part of the series that went on to contain five volumes with further tales in the new Weird Tales in the 1990s. 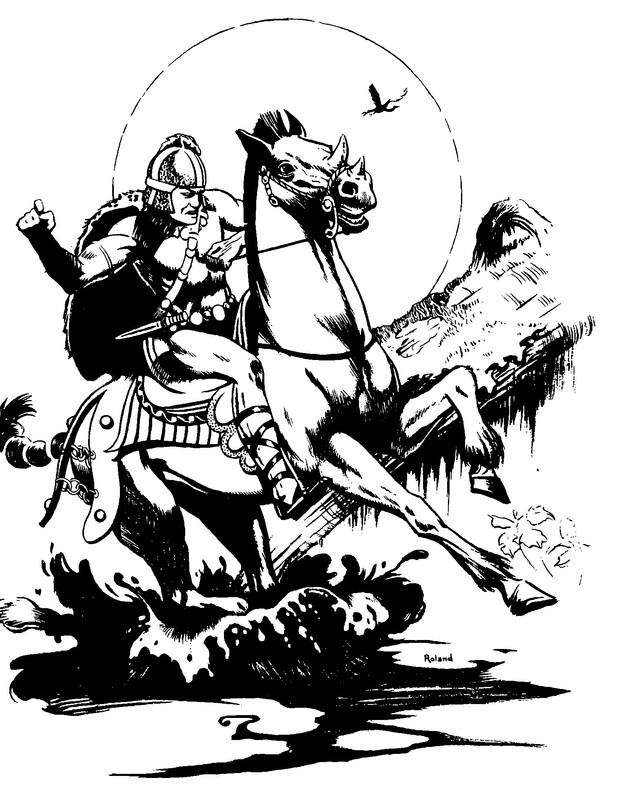 Other heroic fantasy pieces included "The Holding of Kolymar" (October 1972) by Gardner F Fox, "The Night of Dreadful Silence" (September 1973) by Glen Cook, destined for fame with his Black Company in the 1980s, "Death from the Sea" by Harvey Schreiber (August 1975), "Two Setting Suns" (May 1976) by Karl Edward Wagner, part of the Kane series , and "Nemesis Place" (April 1978) by David Drake, featuring Dama and Vettius, Drake's two Roman heroes. Not all of White's choices were Sword and Sorcery. He published the wonderful "Will-o-Wisp"(September-November 1974) by Thomas Burnett Swann, "War of the Magicians" (November 1973) by William Rostler, "The Dragon of Nor-Tali" (February 1975) by Juanita Coulsen, "The Lonely Songs of Loren Dorr" (May 1976) by George RR Martin (long before Game of Thrones) and "A Malady of Magicks" (October 1978) by Craig Shaw Gardner, beginning the popular humorous Fantasy series featuring Ebenezum. By the end of 1978 Fantastic was on a quarterly schedule and losing readership. White had grown more dissatisfied with Sol Cohen, wanting to take the magazine into the slick market. He also wanted a raise. January 1979 was his last issue before he left to edit Heavy Metal magazine. 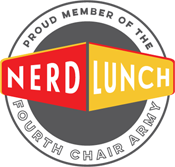 He was replaced with neophyte Elinor Mavor. Another period of reprints followed and the look of the magazine declined. Mavor was finding her feet with new authors like Wayne Wightman, Brad Linaweaver and artists like Janny Wurts. 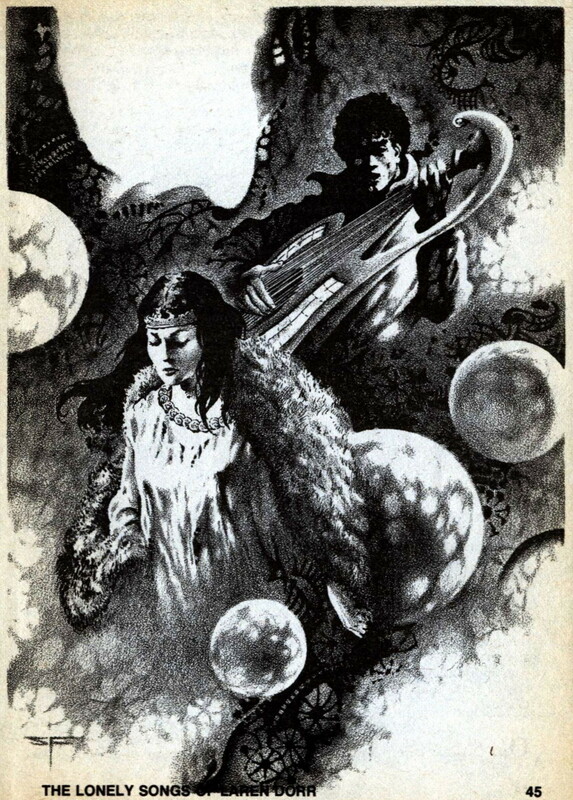 She published Stephen Fabian's graphic story "Daemon" (July 1979-July 1980), but the only gem to appear before amalgamation with Amazing Stories was the two part serial of The White Isle by Darrell Schweister, with illustrations by Gary Freeman, in the April and July 1980 issues. A last gasp of wonder before Fantastic was gone. It was the end of an era, but too few even knew what was lost. Other magazines would attempt to do what Ted White had done, through self sacrifice and continuous networking, but none would ever be such a haven for short heroic fantasy again.